The recent short film by Jason Allen and Chris Esper The Deja Vuers explores this odd feeling of familiarity. The film is about Chuck and Morgan. While walking through the park Chuck is overwhelmed with a strong sense of déjà vu when he spots Morgan on a bench. He’s convinced he’s had dreams about her, and their meeting, but will it be the reunion (of sorts) that he’s dreamed of? At just under 8 minutes long, the film flies by, and is over before you know it. But that doesn’t mean there isn’t a full story involved. As with most other short films, there is a full, and well thought out story contained within those eight minutes, and if it were any longer the flow just wouldn’t feel right. I’ve said it before, and I’ll say it again: people who make short films never cease to amaze me! Having never experienced that type of déjà vu personally, I can see where he’s coming from. Of course it would be freaky to meet a person you’ve never met before, but you know them from your dreams! But according to a Wikipedia page on the topic, these occurrences are not all that uncommon, “One theory of déjà vu attributes the feeling of having previously seen or experienced something that is currently being seen or experienced to that of having dreamt about a similar situation or place and then forgetting about it until one seems to be mysteriously reminded of the situation or the place while awake. The spontaneity of these types of déjà vu "moments" can catch any person off-guard, especially when they get the sensation from visiting a specific place they've never been to before, to the point where they're in a temporary state of shock and disbelief,” it says. When I asked Jason and Chris if they often experience the feeling of déjà vu, Jason replied, “I wouldn't say often, but I've experienced it enough to know that it's a thing. But don't ask me how it works, I haven't a clue. I would like to write a script about it again sometime and perhaps dig a little deeper. With this [film] I wasn't looking to explain anything; I just wanted to have fun with it,” he said. Chris’s answer was a little vaguer, “I can't say I do very often. When I do, it always throws me off a little. I get this unusual feeling that stops me for a couple seconds. [It’s] very hard to describe. Like Jason, I would also love to dig a little deeper into the subject with a film,” Chris said. Perhaps film is another good way to explore this mystical topic, as the definitions tend to be as ambiguous as the subject itself, for example, “Scientific approaches reject the explanation of déjà vu as "precognition" or "prophecy", but rather explain it as an anomaly of memory, which creates a distinct impression that an experience is "being recalled". This explanation is supported by the fact that the sense of "recollection" at the time is strong in most cases, but that the circumstances of the "previous" experience (when, where, and how the earlier experience occurred) are uncertain or believed to be impossible,” Wikipedia says. But, fuzzy definitions aside, déjà vu is something we all experience at one time or another, which makes The Deja Vuers all the more relatable. The film is a comedic take on a subject even science has trouble describing, and had me giggling from the first minute to the last. It’s an excellent example of the “what would I do in that situation,” but taken to an unexpected and amusing extreme. Jason and Chris have made a film that takes the concept of déjà vu to absurd lengths, and I mean that in the best of ways! 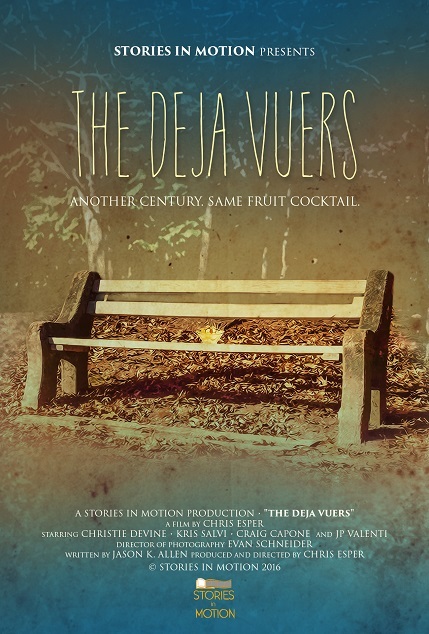 The Deja Vuers is not rated, was written by Jason Allen, was directed by Chris Esper and stars Christie Devine and Kris Salvi. The film is currently being entered into many festivals, so keep an eye out for screenings near you!